Energy development in the Powder River Basin is leaving disastrous impacts on the land, water, wildlife, and residents of the surrounding region. This page will review the Powder River Basin’s history, background on coal, and the impacts that coal mining and burning has on the area. About 40 percent of the energy we use in the United States comes from the coal in the Powder River Basin, including much of the energy in supplied by Puget Sound Energy in Washington. The Powder River Basin is located in southeastern Montana and northeastern Wyoming, stretching 120 miles east-to-west and 200 miles north-to-south. The Powder River Basin is both a topographic drainage and geological structural basin (EarthEnergyAccess). It got its name because it is drained by the Powder River and is also drained by the Cheyenne, Tongue, Bighorn, Little Missouri, and Platte rivers. The main cities located in the Powder River Basin are Gillette and Sheridan, Wyoming, and Miles City, Montana. The coal beds began to form 60 million years ago when the land rose from subtropical shallow seas (Braasch). For 25 million years the Basin floor was covered with lakes and swamps, and as a result the organic material accumulated into peat bogs, which then over time were covered with sediments washed in from the nearby mountains. As the climate became drier and cooler, the peat bogs were buried and compressed, and turned into coal. The resulting coal in the Powder River Basin is low in sulfur dioxide and sub-bituminous (Braasch). The Powder River Basin is known for the copious amounts of coal extracted from the area, because it is lower in polluting sulfur than eastern coal and is closer to the surface, making extraction easier. The Powder River Basin coal boom began in the 1970s, but it was not until after the Clean Air Act of 1990, which required lower sulfur levels, that the Powder River Basin’s low-sulfur bituminous and sub-bituminous coal became the dominant U.S coal for generating electricity, power, and heat (Braasch). The vast majority of the coal in the Basin is owned by the federal government and is leased out by the Bureau of Land Management (BLM). In the Powder River Basin about 500 million tons of coal is stripmined annually. The Basin is home to two of the largest coal mines in the world, the Black Thunder mine and the North Antelope Rochelle mine. The coal is burned in more than 200 power plants in 35 states (The Powder River Basin). The burning of coal from the Powder River Basin accounts for about 13.9% of .S. greenhouse gas emissions (Ostlind), making coal mining in the Basin responsible for more greenhouse gases than any other activity in the U.S. According to the BLM, for every ton of Powder River coal mined, 1.7 metric tons of carbon dioxide is released, resulting in the Powder River Basin being one of the key contributors to climate change (Nichols). The development of coal and methane in the Powder River Basin has detrimental impacts on the wildlife, because it disrupts their habitat by bringing in people, roads, structures, mines, and powerlines. Among the other species impacted are the Sage-Grouse and the Mule Deer. The Sage-Grouse are native only to western semiarid sagebrush landscapes. Due to the degradation of native habitats, the once widespread Sage-Grouse are now gone from half of their original range in western North America. The Sage-Grouse has seen a range-wide population decline of 45-80% and local declines of 17-92% (University of Montana, Fish & Wildlife Biology). The decline in population is mainly in areas of development, which negatively affects the reproduction of the birds by displacing the male population in leks (strutting grounds). The decline in Sage-Grouse population has led to discussion of enlisting the bird as an endangered species. Recently the Endangered Species Act acknowledged that the bird deserves to be listed, but put it in line behind creatures whose demise is more imminent. Once a month, representatives from the BLM, the U.S Forest Service, Wyoming Game and Fish (a sportsmen’s group), a consulting firm, an oil and gas company, a conservation group, and a local cattle association meet to discuss the Sage-Grouse, and what they can do on a local level to protect its habitat. The convergence of these different groups is a great example of people with different backgrounds coming together, finding common ground, and working together on an issue. Energy companies are also getting involved in helping the Sage-Grouse by contributing money to the cause. The state of Wyoming has spent nearly $10 million to protecting the bird (Rott). The U.S Department of Agriculture promised more than $200 million for the sage-grouse conservation efforts (Rott). Mule Deer are also being impacted by the energy development in the Powder River Basin. Mule Deer habitat is being destroyed, their migratory routes are being altered, and their population is decreasing, which also has an impact on the local economy. “Hunting isn't a sport for me; it's a way of life, it's my culture. It is imperative that our public lands are managed to ensure that healthy landscapes and wildlife populations continue to thrive. Our public lands should not be sacrificial industrial zones for corporations." Two decades of coal bed methane drilling, combined with nearly four decades of coal mining, has drawn down the aquifers in the Basin to alarming lows (Cook). Withdrawing water from coal beds in order to extract methane is depleting the coal beds’ groundwater. In 1999 the BLM conducted a computer simulation of groundwater drawdown, showing that in a 15-year period (1999-2015), the maximum drawdown was as much as 550 feet in the Gillette South assessment area and about 300 to 375 feet in the southern and northern parts of the Environmental Impact Statement area (Flores). Coal bed methane extraction also results in the surface disposal of co-produced water, which is the toxic water trapped in underground formations brought to the surface during drilling. The co-produced watered is discharged either directly into existing surface waters or to drainages. This is an issue because the co-produced water can result in erosion or drowning of drainage draws and associated vegetation (Flores). Basin residents are subjected to energy development on and around their land, resulting in the loss of their property and water, which directly impacts their livelihoods. L.J .Turner’s family has owned their land since 1918, but since coal development began, they have lost 6,000 acres (Braasch). The loss of land has impacted many ranchers' livelihoods by restricting the area for their cattle. The depletion of water also impacts the surrounding residents because the water is diverted to mining, rather than used for people and their livestock. As the energy development extends, it encroaches on sacred and historical lands. The Rosebud Valley in southeastern Montana is home to the sacred Deer Medicine Rocks, a National Historic Landmark. This is a special place where Native Americans have carved their prophecies, their history, and their dreams for thousands of years, covering the sandstone walls of the rocks with petroglyphs. The Rosebud Battlefield and many other culturally important sites are being threatened from the increased coal leasing (Bonogofsky). Bonogofsky, A. (2012, December 6). Protecting the cultural and historic values of the Powder River Basin. National Wildlife Federation. Cook, E. (2013, July 25). Living on borrowed time. Wyoming News. Flores, R. M. (2001). A field conference on impacts of coal bed methane development in the Powder River Basin, Wyoming. U.S. Geological survey. Natural Resources Defense Council. (n.d.). Unchecked energy development threatens wildlife, hunting, and tourism in Montana and Wyoming [Press release]. NRDC Report. Nichols, J. (2009, November 23). The Powder River Basin of the west: key to solving global warming. Wildearth Guardians. Ostlind, E. (n.d.). 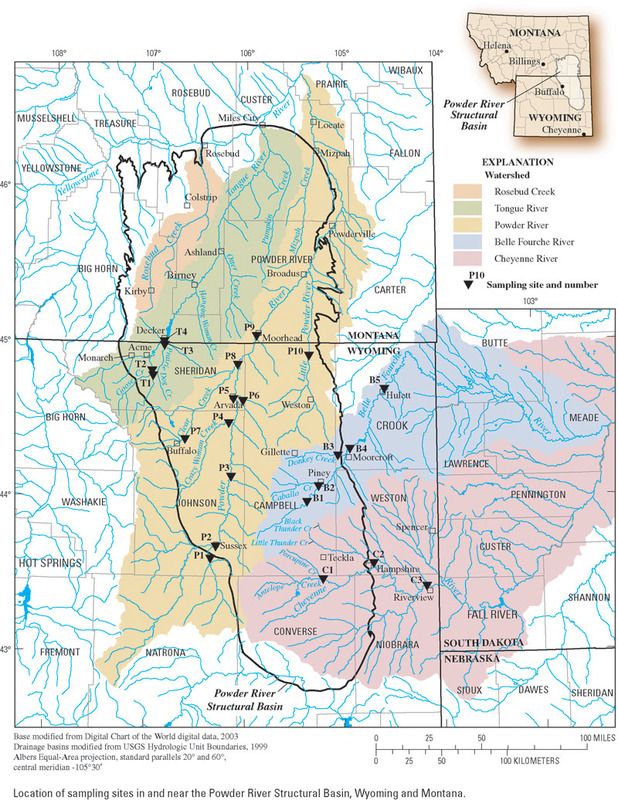 The Powder River Basin: A Natural History. Wyoming History. Rott, N. (2015, September 1). Fight to save the Sage Grouse finds friends in all corners of the West. NPR. Wild Earth Guardians. (n.d.) The Powder River Basin — A root contributor to global warming. Wildearth Guardians. University of Montana Fish & Wildlife Biology. (2008). Sage-grouse and Energy Development: Integrating Science with Conservation Planning to Reduce Impacts. ProQuest. World Heritage Encyclopedia. (2016). Powder River Basin. WorldHeritage.org.